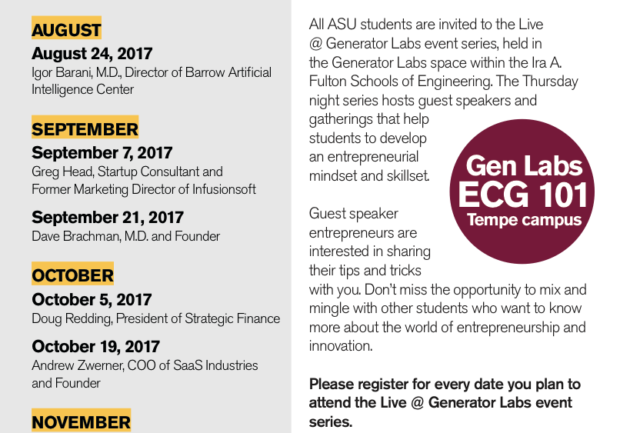 The Generator Labs, located in Engineering Center G-Wing on the Tempe campus, is a space that provides resources to support the Fulton Schools’ entrepreneurial students. Three lab spaces, a café lounge area, and access to faculty and mentors, make the Gen Labs an ideal space for all Engineering majors who want to change the world. The Gen Labs is directed by a team of innovative faculty and staff. Specifically, faculty leaders who are affiliated with Entrepreneurship + Innovation at the Fulton Schools, EPICS, and Devils Invent, are joined by a team of Academic and Student Affairs professionals. 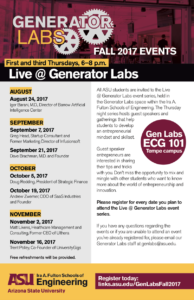 For details about the the Generator Labs staff and initiatives, please connect with Brittany Martin. Brittany Martin, Coordinator for Student Engagement, assists in coordinating and developing the programs and initiatives that live within the Generator Labs space. Engineering Projects in Community Service (EPICS) and all things related to entrepreneurship and innovation — Devils Invent and Live @ Generator Labs Speaker Series — are within the scope of her work. Brittany is always looking for faculty and staff that are interested in engaging with students related to service-learning and entrepreneurship and is happy to welcome you to the space at any time. Please contact her at britt.martin@asu.edu. Entrepreneurship + Innovation empowers all undergraduate and graduate students to advance their entrepreneurial ideas for the benefit of our economy and society. Students learn about technology innovation and marketplace impact through signature entrepreneurship and innovation programs, workshops, expert mentoring, new venture competitions, and other curricular and extracurricular events that expose students to the concepts of technology innovation and marketplace impact. Brent Sebold is the director of Entrepreneurship + Innovation at the Ira A. Fulton Schools of Engineering. 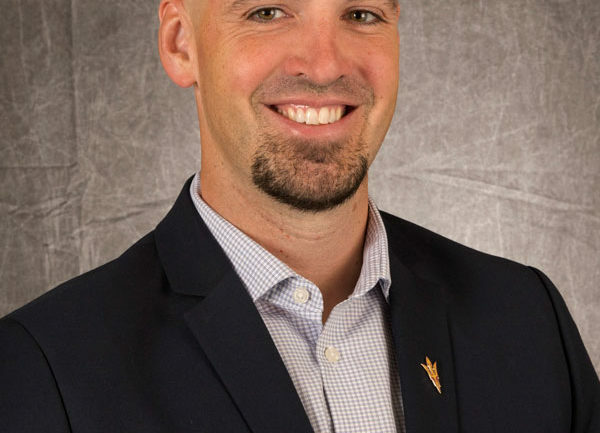 Brent is responsible for the organization and advancement of curricular and co-curricular entrepreneurship programs for all Fulton students and faculty. Brent also co-directs the Fulton Generator Labs, which is a 6,500 square foot workspace for student enterprisers. 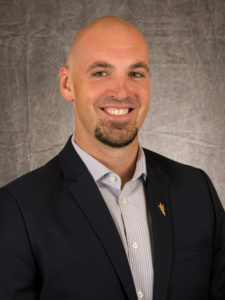 Concurrently, Sebold serves as the Executive Director of Venture Development at Entrepreneurship + Innovation within Arizona State University’s Office of Knowledge Enterprise Development. In this role, Brent leads a variety of enterprise-wide startup support initiatives for student, faculty, and community-based entrepreneurs. Engineering Projects in Community Service, also known as EPICS, is an award-winning social entrepreneurship and community service program. Through EPICS, students have the opportunity to get a hands-on approach to problem-solving while making an impact in the community. Students can get involved in EPICS through EPICS Gold courses FSE 104: EPICS GOLD I – Feasibility and planning, and then FSE 494: EPICS in Action – Design and build. High school students can also get involved in EPICS through EPICS High. These student teams typically work closely with their schools or not-for-profit agencies, taking an interdisciplinary approach to utilize the creativity and expertise of students both already interested in STEM fields, as well as the skills of students outside of engineering or that haven’t yet been exposed to engineering, to develop and implement solutions. Joshua Loughman comes to the EPICS program after spending ten years in the space industry. As EPICS Director, Joshua oversees all aspects of the program including teaching multiple section of the EPICS Gold courses. Joshua develops relationships with not for profit agencies, industry mentors and partners to support the EPICS program. He is passionate about the power of engineering to make the world a better place as demonstrated by his seven years of volunteering with Engineers Without Borders. He looks forward to applying the lessons of systems engineering and his volunteer experiences to the EPICS program. As the Coordinator for EPICS, Brittany Martin oversees the programming and logistics as well as acting as the front line for EPICS students. After working in child welfare for three years, Brittany transitioned into an Operations role within Sun Devil Athletics before joining the Student Engagement team within the Fulton Schools. During her undergraduate years at ASU, Brittany was on the diving team for four years and graduated from Barrett, the Honors College. Brittany also coordinates for the E+I @ Fulton Schools, Devils Invent, Live @ Generator Labs Speaker Series and Study Abroad for the Fulton Schools. Hope Parker is the associate director for K-12 Engineering Education and EPICS High. Hope has worked in education for the majority of her life including both elementary and post-secondary. As a teacher, she worked with pre-K through sixth grade and also as a high school coach. Hope’s passion is to help children change their lives and impacting the world around them through meaningful – real world education.